Read on for my annual year-past/look-ahead report, on text analytics technology and market developments, 2015 edition. A refreshed definition: Text analytics refers to technology and business processes that apply algorithmic approaches to process and extract information from text and generate insights. Text analytics hasn’t been around quite this long: Summary account of silver for the governor written in Sumerian Cuneiform on a clay tablet. From Shuruppak, Iraq, circa 2500 BCE. British Museum, London. Text analytics relies on natural-language processing, based on statistical, linguistic, and/or machine-learning methods. Yet no single technical approach prevails, and no single solution provider dominates the market. There are myriad open source options and an array of via-API cloud services. Academic and industry research is thriving, realized in systems that scale up to go big, fast, and deep, and that scale out, going wide — distributed and accommodating source diversity. 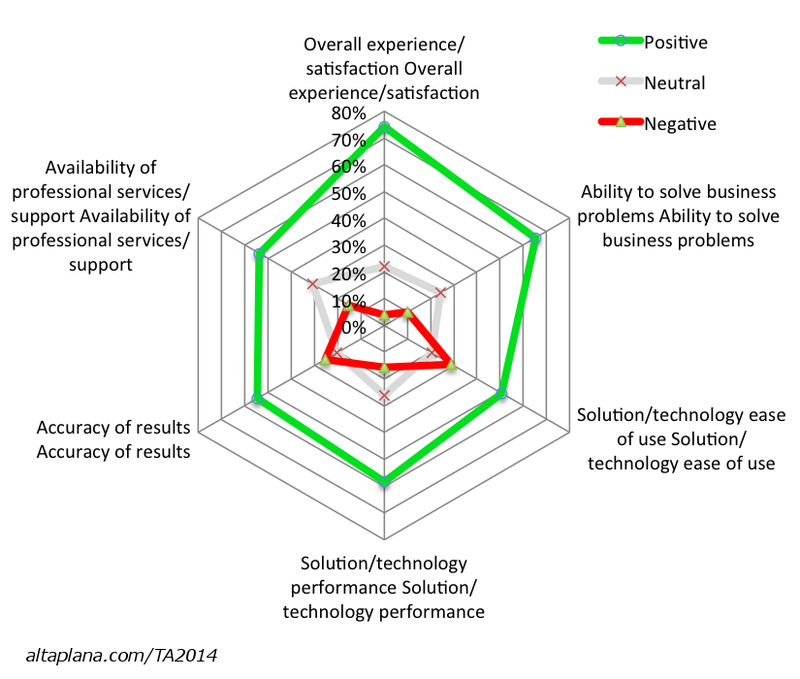 I released a market study, Text Analytics: User Perspectives on Solutions and Providers. The report is available for free download (registration required) via altaplana.com/TA2014, thanks to its sponsors. The key finding is More (and synonyms): Progressively more organizations are running analyses on more information sources, increasingly moving beyond the major European and Asian languages, seeking to extract more, diverse types of information, applying insights in new ways and for new purposes. In the text technology world, cloud based as-a-service (API) offerings remain big, and deep learning is, even more than last year, the alluring must-adopt method. Deep learning is alluring because it has proven effective at discerning features at multiple level in both natural language and other forms of “unstructured” content, images in particular. I touch on these topics in my March 5 IBM Watson, AlchemyAPI, and a World of Cognitive Computing, covering IBM’s acquisition (terms undisclosed) of a small but leading-edge cloud/API text and image analysis provider. I don’t have much to say right now on the cognitive computing topic. Really the term is agglomerative: It represents an assemblage of methods and tools. (As a writer, I live for the opportunity to use words such as “agglomerative” and “assemblage.” Enjoy.) Otherwise, I’ll just observe that beyond IBM, the only significant text-analytics vendor that has embraced the term is Digital Reasoning. Still — Judith Hurwitz and associates have an interesting looking book just out on the topic, Cognitive Computing and Big Data Analytics, although I haven’t read it. Also I’ve recruited analyst and consultant Sue Feldman of Synthexis to present a cognitive-computing workshop at the 2015 Sentiment Analysis Symposium in July. The situation remains that a strong majority of needs are met without reliance on as-yet-exotic methods. Hybrid approaches — ensemble methods — rule, and I mean hybrids that include humans in initial and on-going training process, via supervised and active learning for generation and extension of linguistic assets as well as (other) classification models. I wrote up above that 2015 would feature a particular focus on streams and graphs. The graphs part, I’ve been saying for a while. I believe I’ve been right for a while too, including when I not-so-famously wrote “2010 is the Year of the Graph.” Fact is, graph data structures naturally model the syntax and semantics of language and, in the form of taxonomies, facilitate classification (see my eContext-sponsored paper, Text Classification Advantage Via Taxonomy). They provide for conveniently-queryable knowledge management, whether delivered via products such as Ontotext’s GraphDB or platform-captured, for instance in the Facebook Open Graph. Streams are kind of exciting. Analysis of “data-in-flight” has been around for years, for structured data, formerly primarily known as part of complex event process (CEP) and applied in fields such as telecomm and financial markets. Check out Julian Hyde‘s 2010 Data In Flight. For streaming (and non-streaming) text, I would call out Apache Storm and Spark. For Storm, I’ll point you to a technical-implementation study posted by Hortonworks, Natural Language Processing and Sentiment Analysis for Retailers using HDP and ITC Infotech Radar, as an example. For Spark, Pivotal published a similar and even-more-detailed study, 3 Key Capabilities Necessary for Text Analytics & Natural Language Processing in the Era of Big Data. Note all the software inter-operation going on. Long gone are the days of monolithic codebases. Investment activity is a forward-looking indicator, suggesting optimism about a company’s growth potential and likely profitability and more particularly, the viability of the company’s technology and business model and the talent of its staff. I’ll run through 2014 funding news and mergers & acquisitions activity, although first I’ll again note one 2015 acquisition in the space, IBM’s purchase of AlchemyAPI, and NetBase’s $24 million Series E round. Text Analytics World, March 31-April 1 in San Francisco, co-located with Predictive Analytics World. Text by the Bay, “a new NLP conference bringing together researchers and practitioners, using computational linguistics and text mining to build new companies through understanding and meaning.” Dates are April 24-25, in San Francisco. The North American instance of IIeX, Greenbook’s Insight Innovation Exchange, slated for June 15-17 in Atlanta. I’m organizing a text analytics segment; send me a note if you’d like to present. My own Sentiment Analysis Symposium, which includes significant text-analysis coverage, is scheduled for July 15-16 in New York, this year featuring a Workshops track in parallel with the usual Presentations track. In case you’re interested: I have videos and presentations from six of the seven other symposiums to date, from 2010 to 2014, posted for free viewing. New this year: A half-day workshop segment devoted to sentiment analysis for financial markets. The 2014 LT-Accelerate conference in Brussels. The Riga Summit 2015 on the Multilingual Digital Single Market, April 27-29. The annual LT-Innovate industry summit, covering the broader set of language technologies, will take place June 25-26 in Brussels. The second Language Technology: Accelerate conference, which I co-organize with LT-Innovate, is scheduled November 23-24 in Brussels, Belgium. SAS Global Forum 2015 takes place April 26-29 in Dalles, with text analytics and sentiment analysis presentations once again part of the mix. Linguamatics will hold its annual spring users’ conference April 13-15 in Cambridge, UK, focused on life sciences applications. Moving to non-commercial, research-focused and academic conferences… I don’t know whether the annual Text as Data conference will repeat in 2015, but I have heard from the organizers that NIST’s annual Text Analysis Conference will be scheduled for two days the week of November 16, 2015. The 9th instance of the International Conference on Weblogs and Social Media (ICWSM) takes place May 26-29 in Oxford, UK. And the annual meeting of the Association for Computational Linguistics, an academic conference, move to Beijing this year, July 26-31. I’ve already cited my own Text Analytics: User Perspectives on Solutions and Providers. Butler Analytics’ Text Analytics: A Business Guide, issued in February 2014, provides a good, high-level business overview. I have mentioned many companies in this article. I consult to some of them. Some sponsored my 2014 text-analytics market study or an article or a paper. (This article is not sponsored.) Some have sponsored my conferences and will sponsor my July 2015 symposium and/or November 2015 conference. I have taken money in the last year, for one or more of these activities, from: AlchemyAPI, Clarabridge, Daedalus, Digital Reasoning, eContext, Gnip, IBM, Lexalytics, Luminoso, SAS, and Teradata. Not included here are companies that have merely bought a ticket to attend one of my conferences. If your own company is a text analytics (or sentiment analysis, semantics/synthesis, or other data analysis and visualization) provider, or a solution provide that would like to add text analytics to your tech stack, or current or potential user, I’d welcome helping you with competitive product and market strategy on a consulting basis. Or simply follow me on Twitter at @SethGrimes or read my Breakthrough Analysis blog for technology and market updates and opinions. Finally, I welcome the opportunity to learn about new and evolving technologies and applications, so if you’d like to discuss any of the points I’ve covered, as they relate to your own work, please do get in touch. Some good collections of contents, I still believe Industry is not focusing much on the feature engineering part which is highly crucial for text analytics. In order to move forward in its development, industry must keep a closer look at those text analytics and conferences. What a pity, a lot of firms keep their traditional approach towards the needs of their innovative customers!